132. 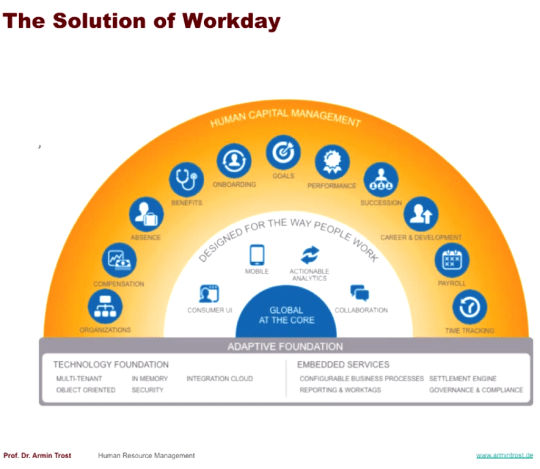 Human Resources Management: Software to Manage Your Entire Company – How to Shape Human Behavior. Go to their individual websites and have a look at, and get the feeling of, what these kind of systems can do. These systems allow you to maintain and organize your entire company organization and structure, always allowing you to see who works for who and who is the manager of who. This is important to know for performance reviews and appraisals, salary, approval for vacancy requests, etc. Tracking the career of each employee from first interview to hire date, promotions, special projects, to when the employee leaves the company. Succession – knowing who could step into a position with little notice were a high ranking employee, such as the CFO, were to leave. A manager posts a vacancy request on the company’s internal software. That vacancy request is sent to the recruiting department, which creates an advertisement for the open vacancy. This online job posting is submitted to online job boards. Job applicants can then see the open vacancy and apply for it. All applications go to the recruiter for pre-selection. The recruiter’s shortlist of potential candidates is then forwarded to the manager who made the vacancy request to set up job interviews. After the candidates have been interviewed, a final candidate is selected to fill the vacant position. 00:24:42 A ‘portal’ is a user’s personalized entrance into a system. It is the user’s administrative screen which gives that user access to every relevant part of the software. Sales representatives would not have the same portal page as an accountant or a HR employee. Personalized – based on your previous consumption and usage: For example your Amazon page. Unpersonalized – the same for each user, regardless of their previous consumption: For example Google’s page. 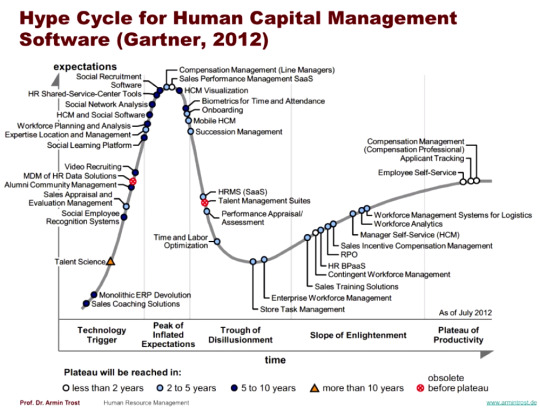 00:27:43 The Hype Cycle for Human Capital Management by Gartner offers comprehensive reviews on existing HR systems. Each year, this hype cycle shows the level of ‘importance’ and ‘hype’ a particular HR tool has, as well as where it it is expected to go in the near future. 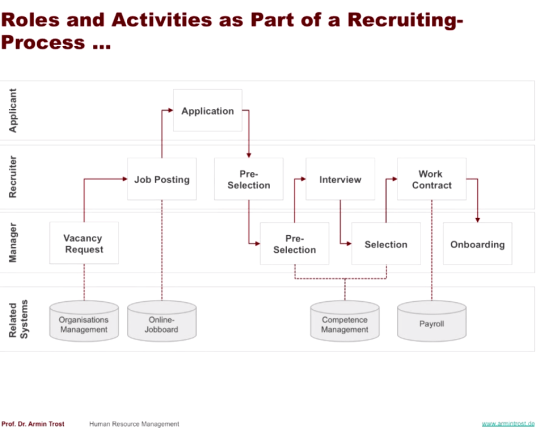 Video recruiting, considered a technology trigger in this 2012 cycle, was an up-and-coming tool used by HR recruiters during candidate selection. According to the hype cycle, video recruiting’s popularity will only increase in the near future as HR overestimates it’s usefulness before reaching a plateau and then falling drastically to the point where it becomes underestimated. Eventually it will likely be accepted as just another option in HR recruitment. Social where social media platforms such as Twitter and Linkedin are used for collaboration and communication at work. For example, candidates can apply for a job with one click of a button using their already created Linkedin profile instead of having to input that information into the company’s unique system. Mobile where employees and managers can do business using their mobile phones. For example conducting pre-selection of candidate applications while the manager is at the airport waiting to board his or her plane. Cloud computing where data storage space is stored externally and backed up at massive storage facilities, allowing access to the information anywhere in the world at anytime. Big data is value creation where unstructured, quickly changing data is mined and sorted to extract highly-potent and usable information about customers and other relevant information. Posted on August 18, 2015 January 17, 2017 by Joshua SMITHPosted in videosTagged Armin Trost, hochschule, human resources, videos, youtube.